Discussion in 'Tarantula Questions & Discussions' started by CABIV, Oct 29, 2015. 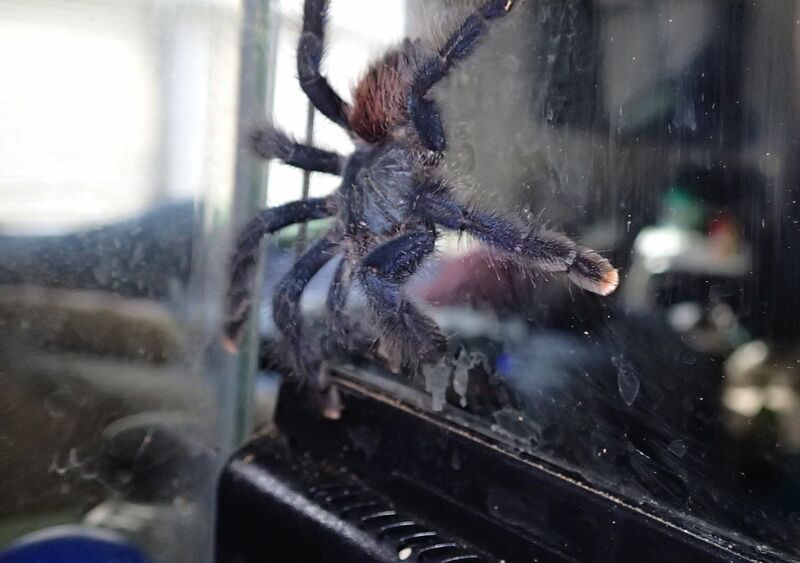 This tarantula (A. avicularia) keeps having trouble, and now I'm a little freaked out. It has been weak and inactive for a while. It hasn't eaten anything for months and lately its lost some weight (visible in photographs I will upload shortly). I tried putting it in a small container with a cricket and a super worm, which it killed but did not eat. Then I gave it some water... Bingo, it drank! I was happy because I hoped I had found the problem, but now something is wrong. Its been sitting over its water dish for a bit (where I put it), and now I noticed there is white foam on its face, and a white substance that has sunk down beneath the water where it was sipping. Its almost as if the tarantula threw up. What does this mean? Is my spider sick? It certainly hasn't been behaving normally for a while now. All my other arachnids appear just fine, this has been the only one that consistently has problems. A picture would help. Particularly of the mouth area. Nematodes could be the cause, but we can't be sure without a picture. Alright, I snapped a series of photos today. I also removed the cage furnishings while I had the spider out of her tank, since I think its time to replace them (to many hiding places for crickets, might be harboring pests). The following photos were taken prior to the tests. 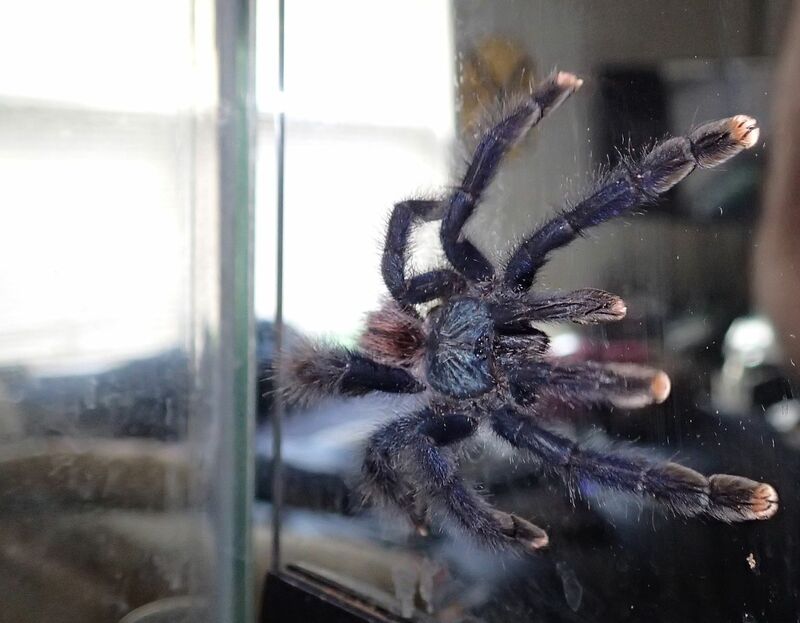 It was a little tricky to get good shots since the glass is dirty, but the tarantula hasn't been especially mobile so I was able to open the door she was on and photograph her directly. This shot is dusty, but this white crust has been near her mouth for a while. I had assumed this was junk from the last time she fed, but its never really went away. That said, it looked crusty, not foamy. Some over head shots. Nothing like mites or anything seemed visible but I may need to look closer. I have a jewelers loops and some other optics I can use to get a better look. If the spider stays still, my camera can take incredibly close shots as well. The spider appeared to get nervous and spin around, but did not otherwise move much. The left leg IV has always been missing since it came home from Petsmart roughly 8 months ago. I took no photographs, but it was only in the container for a few minutes. Once it drew to the water like a magnet, I figured that was the issue. Rather than stress it further, I put it by itself back into its tank with its water bowl. The spider did not dart or move quickly, though it did flick away the food items I put in with it. It moved slow and methodically (as these spiders often do), but not smoothly. At the same time, it didn't exhibit any shakiness, it just seemed weak and tired. I noticed that while transferring it between the tank and container (and vice versa) that it did not stick well to the sides. It didn't seem to make a strong effort to stay clung either. In fact, it almost seemed to flop off, with legs just being held stationary in the air. That said, it never truly flopped, it eventually pulled itself over into the cup. When I put it back into its tank, it kinda partially slid out, though it was clearly also trying to climb out with its legs. Again, it seemed weak and slow, but not shaky, and not weird. 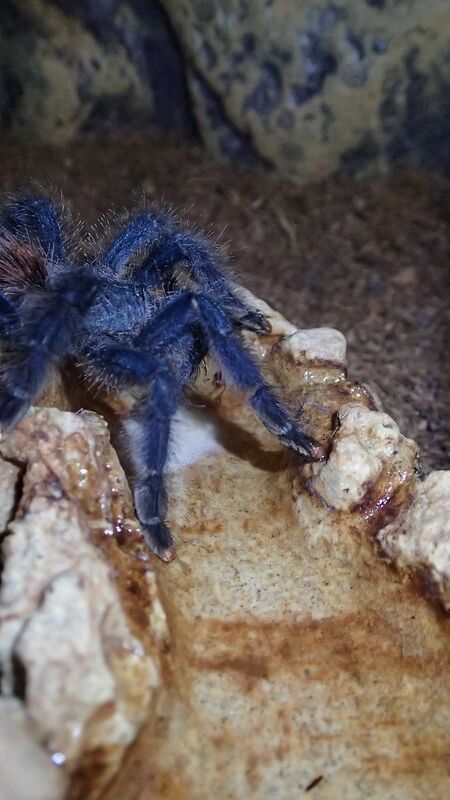 The spider started reaching around with its front feet as they often do when going places, and felt the water of the waterbowl on her toes, and made her way onto the water bowl and dipped down for what looked like a drink. It stayed in this position from that point until I had to leave for work. Right before I left (and when I made the post), is when I noticed the white foam. In the photos, I was unable to get a shot of the foam on the spiders mouth, but you can see the white puddle around it. The water bowl is full, but the water isn't visible in the photos. The white stuff sank to the bottom and didn't seem to dissolve. I would have moved the spider, but I was unsure if I should move it again so I left it. There is a second clean water bowl in there, so it might find its way to that one. It looks like the spider next door is watching as well. I'm hoping this doesn't spread, that G. Rosea is just fine. Seems like not all the photos will load, but hopefully this will be enough. Watching? The Rose hair definitely can't see the Avic. Terrestrials in particular have poor eyesight. I honestly am not seeing anything wrong with the Avic based off of those photos. It wasn't an entirely serious comment, it just looks that way. That said, for a spider with poor eyesight, that G. Rosea seems to be able to see well enough to track me around the room. It often seems to turn to face me. Then again, I'm a bigger target. I'm not sure if all the photos are loading, but there is a big white puddle beneath its mouth. It may look like discoloration of the rocks, but its there. This one is fuzzier, but it might load better. This is a picture form a few months ago. I know its a different angle, but the spider was definitely plumper and more active then. Even if the photos aren't showing anything, the behavior is significantly different. 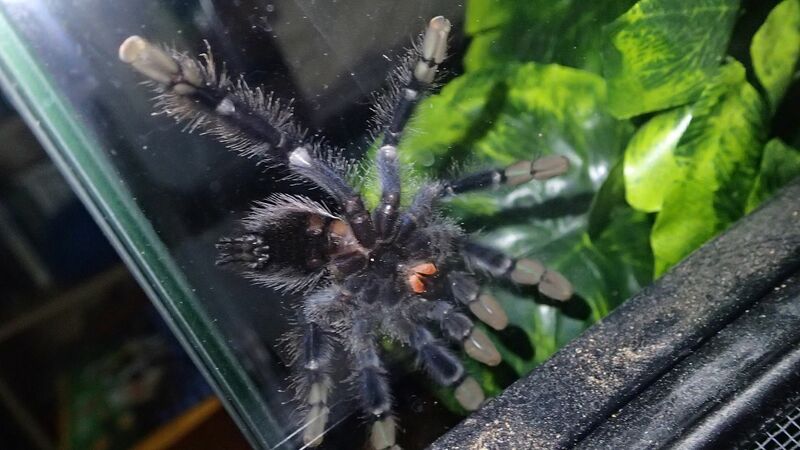 My first Avicularia started doing the same thing (not eating, getting more lethargic) and eventually it passed away, so I'm really trying to avoid that with thise second one. I suppose I've been doing this for a year and half now, and I've really tried to take it easy, but everytime I look at this thing, it seems more tired and less mobile. 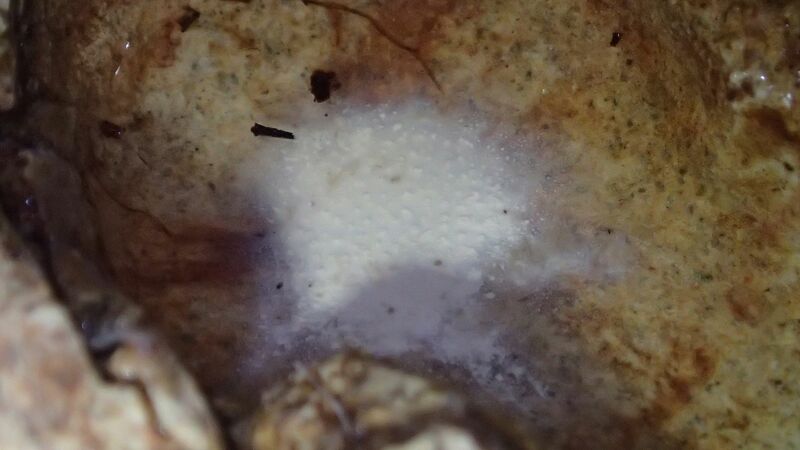 What you are seeing and what I see in the pictures looks somewhat similar to a problem that we had with unidentified mites several months ago. I looked up the thread again so I could give you the link instead of typing all the information out again. Ah I see, didn't realize you were joking. Sounds like my female H.maculata who will freak out sometimes from me simply walking past the tank. Then again I hear that arboreals have better eyesight. I see what you're talking about now. You said it was dry though? It could be poo. I'm not sure what else it could be. Wish I could be more help to you. It looks like everything, let's be honest. Photos are a bit hard to see what the white stuff is. Could just be poop. The poor fella does look quite on the skinny side though. How big is it (diagonal leg span) about? Have you tried leaving prekilled food? The leg shouldn't be a problem. It'll be as good as new in a couple molts. Has it set up any webbing to chill in? Do you have anchor points available so it can start a nice tube web? Hope the little guy pulls through. The fact it's drinking water is a good sign at least. I worry about this. I have kept the cage on the dry side and doubled up on the water bowls to try and make up for it. Many say this species needs higher humidity and higher ventilation, but when I tried that with my first Pink Toe, I still kept getting pest problems. The second one seemed fine in the relatively "dry" conditions. Upon close examination though, I have not spotted any mites (this is not to say they are not there), and the cage itself is fairly dry. I'll wait a little while before I stress the spider out with its on ICU. 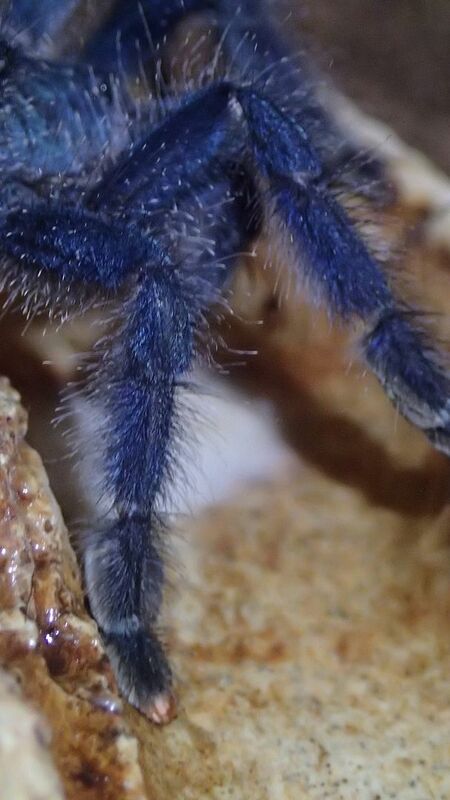 I have looked fairly closely at the joints of the tarantula without spotting anything, but its worth a shot. Not dry, it sunk to the bottom of the water bowl (heavier than water). It was definitely coming from the tarantula's mouth, as the fangs foamed up. If I hadn't seen it come from the spider's mouth, I would have also believed it was poo. I simply couldn't get a better shot without disturbing it, or sticking the camera in the cage next door. Once the spider moved on, there was one more smaller "throw up" pile sunk on another end of the water bowl. I scooted the spider away because I figured I shouldn't leave that stuff to marinate in the water. That said, i did take some photos before I cleaned it. I will post them later. The consistency was milky white, with a bunch of small uniformly sized chunks. As i said, I saw it come from the mouth of the spider. When I found a second pile in the bottom of the water bowl, the rear end was over the outside of the bowl anyway. The skinnyness has improved somewhat with the water it drank, though I'm not 100% satisfied. It still is walking alittle weakly. I'll need to measure her leg-span again tomorrow night, but she isn't much larger than 3", if that. I have not tried to give pre-killed food. I might try it, but this spider used to hunt well. I'll try, but my gut says this spider isn't "hungry". Neither of my Pink Toes never webbed much. I've had this one since late february/early march, and I have only seen it create a few patches. It doesn't seem motivated to make a lair or anything, it just likes to be stuck the the doors or the glass sides. In the past, it would hide in the leaves of a bushy plastic plant, or sit on top of the log I had in there, but it rarely was hidden. 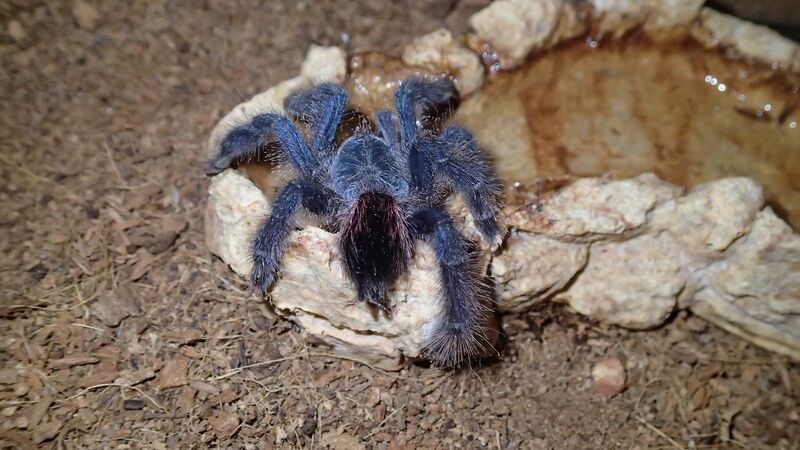 In fact, the only spider I have that likes to hide is my A. Seemanni. The rest just sit in the open all day long. For this reason, I did remove the plant and log and I have left the tank empty. They looked nice, but I suspect that it was more of a haven for the crickets than the tarantula. Not only could the crickets evade the tarantula, they could evade me, and the uneaten crickets would die and their bodies would be difficult to locate in a timely manner. A chirping cricket took residence in the hollow log and so that was the last straw. Does it have lots of anchor points? 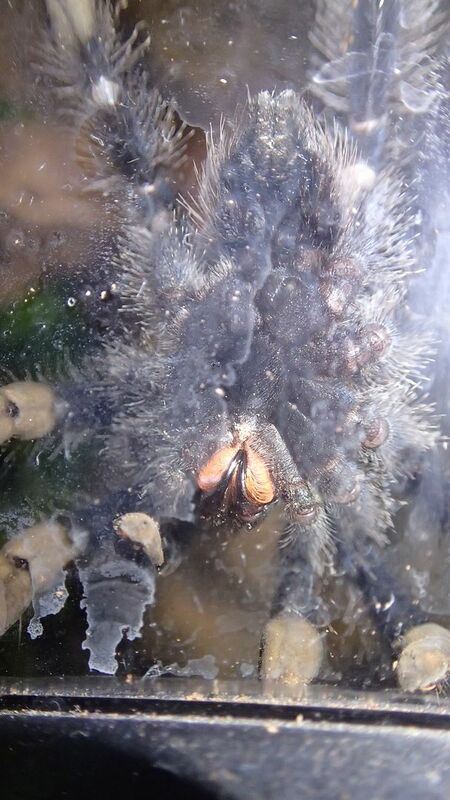 A.avic and A.metallica are the least "webby" out of all the Avics in my experience. What you're describing may be nematodes. Just in case it'd be a good idea to quarantine it. Dispite the white foam episode, it seems getting a drink has helped this spider out. Maybe I need to glue a water dish higher up the enclosure? This spider seems to be able to freely use the pedipalps, and it struck at my forceps when I retrieved the water dish (it was trying to get out the open door so I was hearding it back in). I closely inspected and photographed the water dish, but saw no wriggling. Keep in mind this is below the water, sunk to the bottom. I figured it unwise to leave this pile in there, but I did not see any wriggling or movement. It looked more like chunks. The "bushy" plastic plant went 2/3 of the way to the top of the 18" cage, so i would say there were plenty of anchor points. My first Pink Toe did in fact make a small nest in the core of it, but it was more like a few leaves were stuck together. Even then, neither of them seemed to web much. I would watch them put webs down occasionally, but then it simply wouldn't be there later. That looks like poop, not nematodes. I've actually been wondering if maybe this T is impacted. It looked more like chunks. It seemed like it plumped up a bit the other day after it got some water, though it hasn't really moved much. Not unusual for a spider I suppose. I saw it come from the tarantula's mouth. If it is impacted, how would one tell? This tarantula hasn't eaten in months. All crickets and food items have been accounted for. Well, its not looking good. 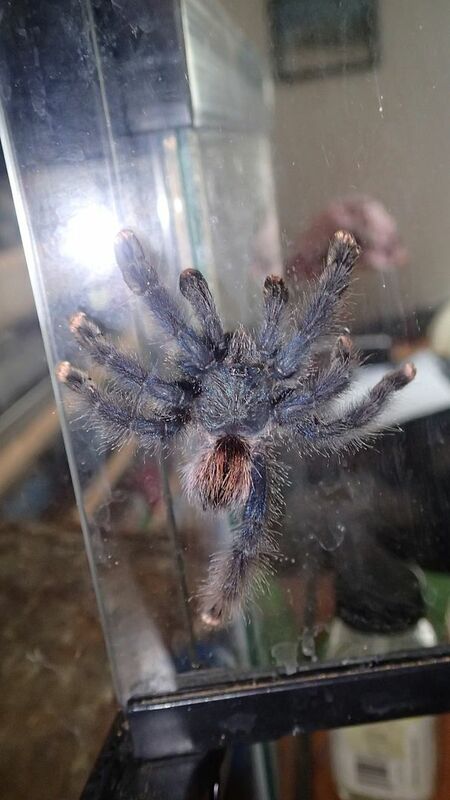 This tarantula has started to get very curly and weak. I tried to steer it towards some water, but now there is significant amounts of dry crusted foam around its mouth. I suppose I can prepare an "ICU" for it in the meantime, but I'm not sure what good that will do. the damned thing took up so much water and apparently its gone back to skinny in a week. This makes me sad, because I liked this little guy. Didn't even care about the missing leg. I'm really sorry to here that he's worsening. I don't know what I would do in your position except wait for advice from someone, though I don't know that there is any advice that will help at this point. Yeah, that's what is sort of depressing about this hobby. 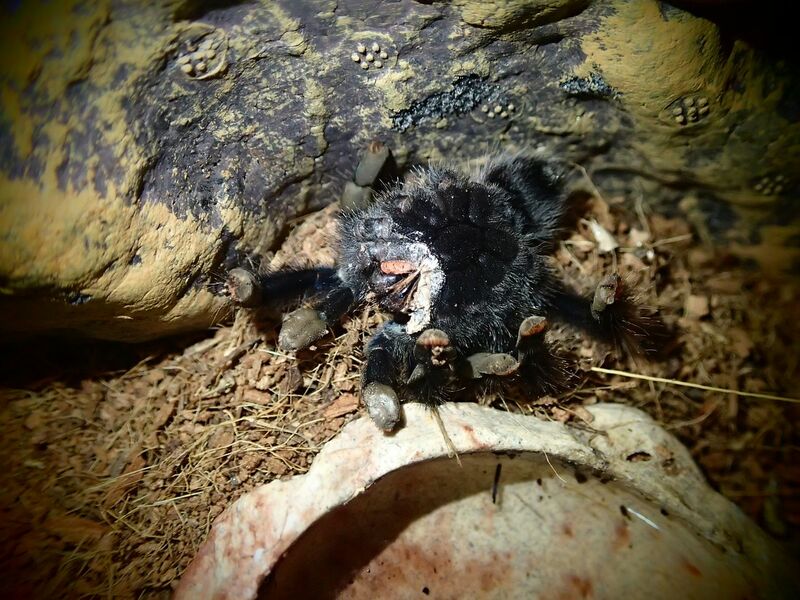 It seems like there isn't a whole lot you can do about a sick tarantula. I just wish I knew what was wrong with it. This is my second Pink Toe, and it did the same thing! It stopped eating for months, wasted away, and then this. 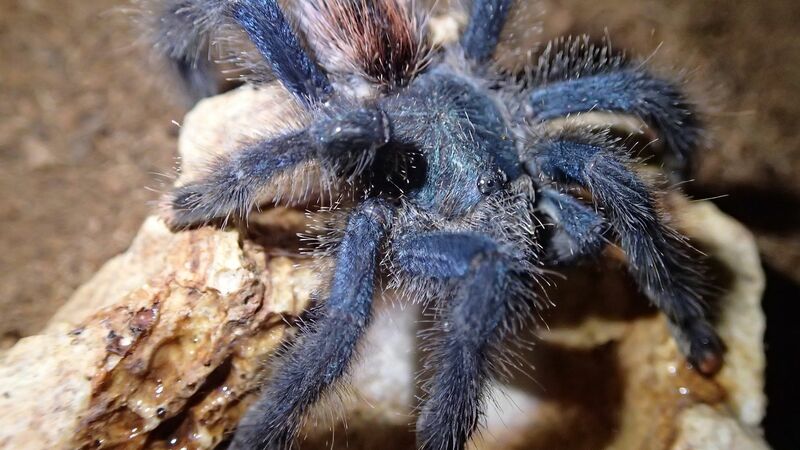 Its making me real hesitant about picking up any new Avicularia types. 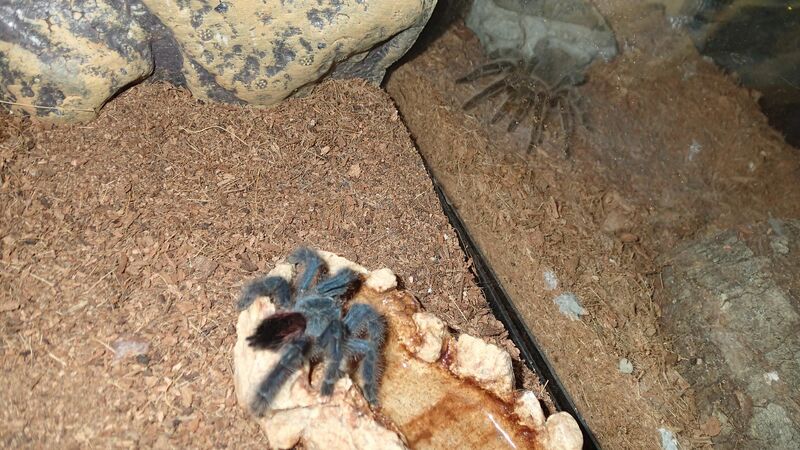 Is it that these are "Petsmart" tarantulas? Is this specific species vulnerable to stupid things? Is my cage wrong? Was it just bad luck? Its particularly upsetting because I've managed to keep several other types which all seem relatively well off and active. I just don't get it. When I looked into "Foamy Avicularia", it seems like this is actually not an uncommon occcurence, but there are so many "reasons" that its impossible to make sense of it. Some say nematodes, some say dehydration, some say it just burped or something ridiculous. Some live and some don't. I would think this is a relatively common pet species so people might know something about them, but that may not be the case. To many variables, nothing solid.